I had 6 men in my dinning room for dinner one night last week. Yep, me and 6 men. Okay, one of them was my Hubby. The rest were co-workers, some from out of town, a few local. They had been sequestered all day in the boardroom. Going over yearly sales figures, projections and predictions for the year yet to come. They arrived hungry and thirsty. No more charts or graphs here. Just great food and engaging conversation. 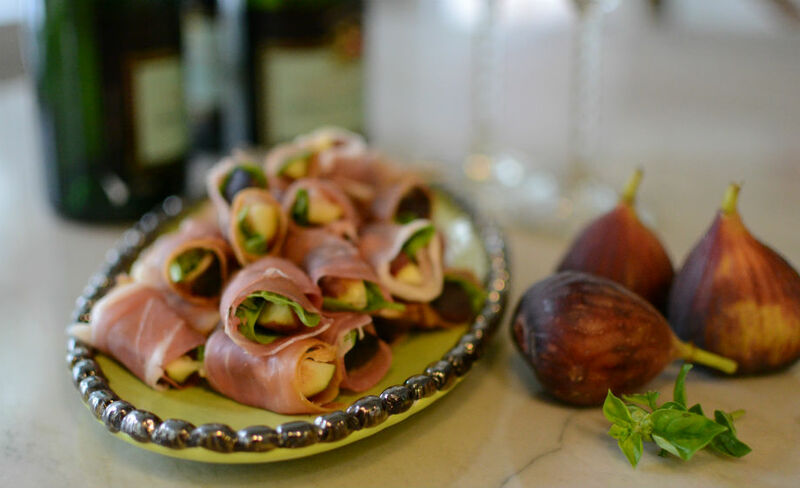 We started with these Fig and Prosciutto Bundles. With the thinking that if you wrap it in some type of bacon they will eat it. Even if you have hidden a fruit and herb in there. Dinner was a huge strip steak dusted with this fabulous rub. Served with these warm garlic parsley potatoes, and parmesan roasted asparagus. Finishing up with coconut macaroons and fresh fruit. They are gluten free, which is good. However, they are really caloric. You don’t want to scarf down the whole batch. I had to get someone, besides me, to eat them all. I have absolutely no willpower when it comes to these beauties. I was so grateful the guys gobbled them all up. That left all the fruit for me. 6 ripe figs, each cut into 6 segments. Lay a strip of prosciutto on flat work surface. Slather with 1/2 tsp of dijon. Place 1/6 piece of fig in center, top with a few basil leaves. Roll up and place on serving platter. I was a lucky woman as I had been able to taste this appetizer before the crowd arrived. It’s phenomenal tasting!